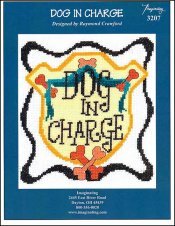 Dog In Charge [D6645] - $6.00 : Yarn Tree, Your wholesale source for cross stitch supplies. Cross stitch chart from Imaginating. Designed by Raymond Crawford. Who let the dogs out?!?! A man's best friend is always in charge & this design is a perfect way to display their badge of honor. This design comes with puppy kisses, wagging tails, wet noses & love. Stitch count 86v x 93h. Stitched on #2936 Zweigart Aida 14ct White 59" wide or #8221 Zweigart Aida 14ct White 43" wide.